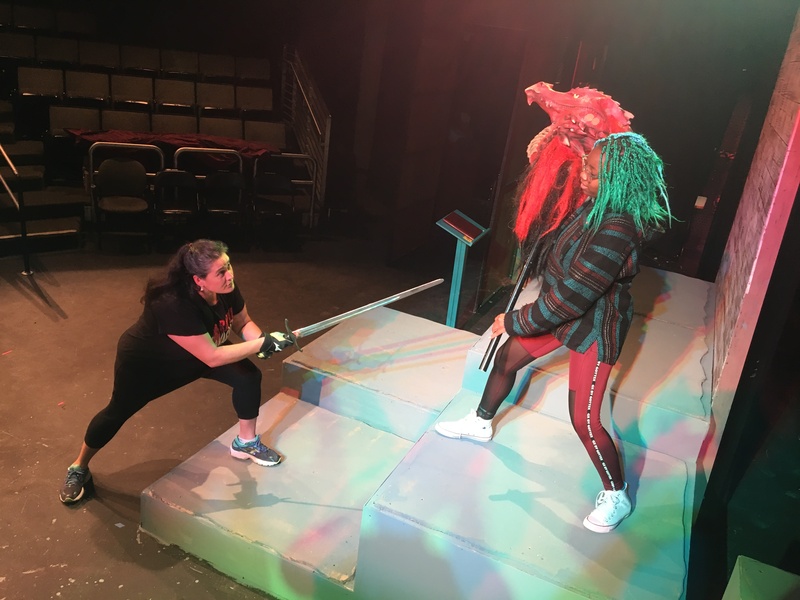 Improvising is never an option for the exhilarating battle scenes in the current Foothill Theatre Arts production of the 2011 dramatic comedy She Kills Monsters, which features dragon-fighting maiden warriors lethally adept at wielding sword, axe and javelin. For fight director/choreographer Carla Pantoja, actor safety is always the paramount consideration. Thus every sword thrust or punch is carefully staged and rehearsed. Pantoja didn’t acquire her taste for a good fight on the quiet streets of her native Santa Clara, where she still lives and is raising two children. 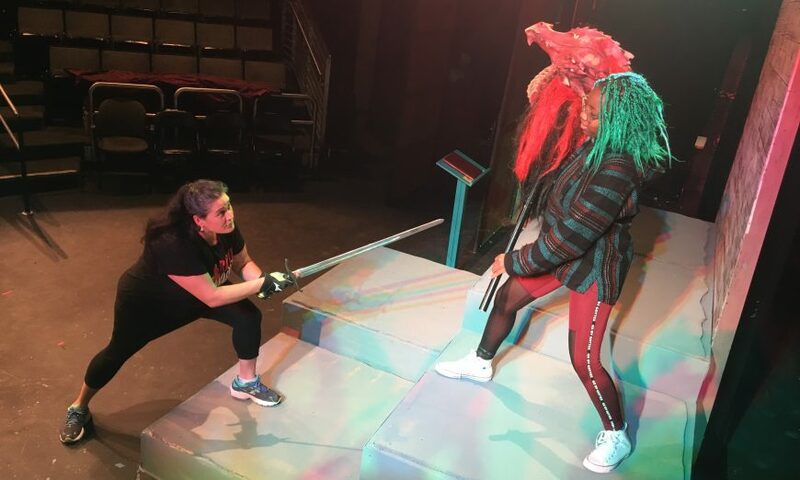 It was the British Academy of Stage & Screen Combat in London that opened her eyes to the possibility of a nontraditional career — especially for a woman — as an instructor of theatrical combat. Pantoja shared that injuries have occasionally occurred when schools or theater companies with tight budgets didn’t hire combat choreographers. Cutting fight rehearsal time also can lead to accidents. 2016 was a headline year for tragic stage accidents. A Japanese actor was stabbed in the stomach with a samurai sword and died in Tokyo, Japan. An Italian actor choked to death in a hanging scene. And in Auckland, New Zealand, during a high school production of Sweeney Todd: The Demon Barber of Fleet Street, two teen boys were hospitalized for moderate-to-severe neck cuts from a makeshift razor blade that had been insufficiently dulled. Genuine weapons are not used in stage productions. The San Francisco Bay area has two companies — Weapons of Choice in Napa and National Stage Armory in the South Bay — that forge and make armory for stage use. Swords, for example, although still heavy, have rounded tips and dulled edges. Pantoja has served as fight director throughout California for productions by high schools, colleges and theater organizations. When she started out in the late 90s, she was the only woman in the field in the Bay Area. Now, out of five certified stage fight directors, two are women. She is a finalist for two 2018 Theatre Bay Area Outstanding Fight Choreography awards. “The bigger theater companies like to go with men, but I’m still here,” said Pantoja, who majored in theater and Spanish at UC Davis. Although Pantoja has many times staged the fight scenes for often-performed dramas such as Romeo and Juliet, it is her first time to direct the fight scenes in She Kills Monsters. At Foothill College’s intimate Lohman Theatre, where She Kills Monsters is staged, the audience looks down at the stage. That setting lends itself well to both subtle and more exaggerated and theatrical choreography. She Kills Monsters debuted with acclaim in New York City. It is the high-action and ultimately poignant story of Agnes, a high school teacher whose parents and teen-aged younger sister were killed in a car crash. Finding her sister’s manual for the game Dungeons and Dragons, Agnes enters a fantasy world of ogres and demons, where her sister reigns as an uber-warrior. To learn how to slay a five-headed dragon, contact Dueling Arts San Francisco at www.duelingartssf.com.